The Angling Trust’s Campaigns Chief Martin Salter joined environmental NGOs including the RSPB, WWF, Wildlife Trust, Marine Conservation Society and the National Trust at a special EU referendum workshop organised by Wildlife and Countryside Link on Tuesday 26th July at the Cass Business School in London. The purpose of the workshop was to explore the implications of Brexit for wildlife and the environment given that many of the protections currently in place derive from EU law and Directives. A panel of expert speakers went through the steps that need to be taken to ensure that threatened species can continue to be protected and how fisheries and the marine environment can be managed sustainably once the decision to leave the European Union is enacted. The Angling Trust also recently organised an Angling Summit with Fisheries and Farming Minister George Eustice, who kept his post in the recent reshuffle, and Brexit was at the top of the agenda. The Minister indicated that Directives and regulations would continue in the short term, but that they might be modified to make them more relevant to domestic needs over time, and that international commitments such as the Bern Convention would remain in place. He made some welcome indications of his intentions to rationalise the farming subsidy regime to make payments conditional on protection of the water environment. There was also a discussion about marine fisheries and the possibility for more domestic regulation of inshore fisheries, despite the UK probably remaining involved in the Common Fisheries Policy. "This is an uncertain time in politics and the Angling Trust is working hard with our partner organisations in fisheries and the wider environmental field to ensure that the important protections that we currently enjoy through our membership of the EU are not lost once the UK leaves. We are also co-ordinating the production of a discussion paper, with input from several fisheries conservation organisations, setting out the challenges and opportunities arising from Brexit, which we will be sending to the new Environment Secretary Andrea Leadsom in the next fortnight." 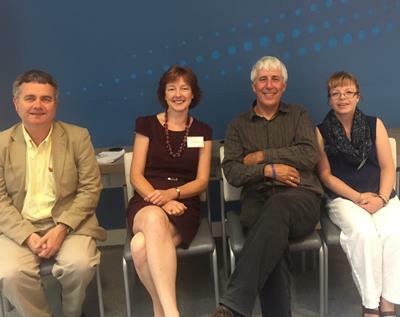 From left to right: Dominic Dyer from the Badger Trust; Dr Elaine King, Director of Wildlife and Countryside Link, which represents organisations with a combined membership of more than 8 million people; Martin Salter from the Angling Trust; Kate Jennings from the RSPB.